Shorte.st is one of the best link shortening networks in the world. The revenue models of this network are CPC and CPM. This is the best source for webmasters who got tired of earning peanuts through mainstream advertising and affiliate marketing. It is similar to Ouo.io and Al.ly networks. You don’t need much effort to make decent money shortening links. All you have to utilize the monetization tools efficiently. More than 300,000 users are earning money using Shorte.st. The best thing about this network is you don’t need a website to get started. Many Facebook page owners, Twitter influencers and forum posters are making decent income out of it. But there are benefits of having blog or website. Links : You can use this tool to shorten all the links on your site. However there are 2 options available: Include domains and Exclude domains. For instance you own a site named myownsite.com. If you use Include option then this tool will shorten only links of myownsite.com. Where as you can restrict shortening links of myownsite.com using Exclude domains option. Entries : You could use this tool for showing an external page with an ad once some one visits your page. However you could set Trigger type (On entry or On click) and Timeout. Exits : You could use this tool to leverage bounce rate of sites. When a visitor wants to leave the site or page within short time and clicks the backspace you get paid. However the ads would be shown only to visitors who decides to exit the site. Popads : This is the best way to boost your revenue. When a user clicks on the site or page automatically an external page with a popup ad would appear. However you could set limit and time for it. Quicklink tool is ideal for all irrespective of webmasters and non-webmasters. These days having Social share widgets on blogs and sites is quite common. Monetizing the widgets is an innovative idea. All you need is placing a simple code on the page that you want to monetize. You could use Mass shrinker tool to shorten 20 links at a time. WordPress users can straightaway download the Shorte.st plugin and enjoy the revenue. If you are a serious developer then you could use take advantage of shorte.st’s API. The social media influencers can share their links in their posts, messages and comments. The affiliates can shrink their promotional links and benefit from both ways. Advertise on traffic exchanges and PTC sites. Place links on adult, spam and hacking sites. Had broken any copyright laws. Spam with links on forums, blogs etc. 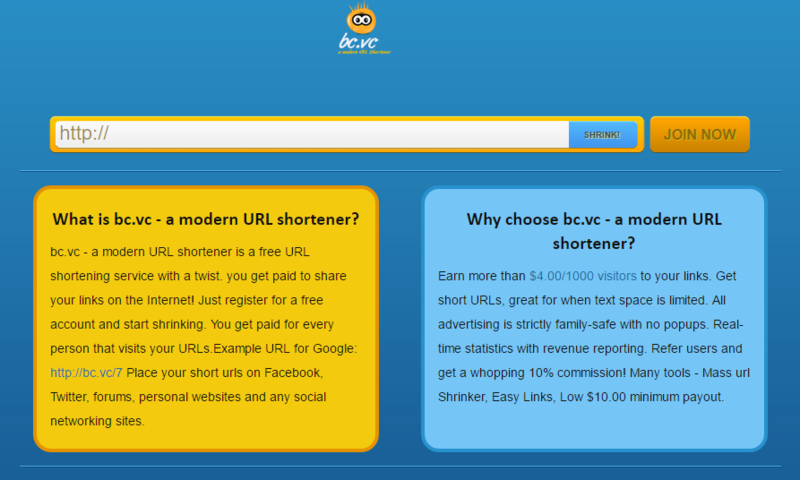 Click on their own links or incentivize users to click on the shortened links. Use bots to manipulate clicks. Redirect the shortened links automatically. Use bots, software, PTC sites, proxies or auto surf sites to generate fake traffic. You get paid on Net 30 basis. The minimum payout is $5 if paid via PayPal and Webmoney. For Payoneer it is $20. The affiliates can earn huge income referring others. The commission rate is 20%. This is the best affiliate program till now. No other ad network has offered 20% commission to its affiliates. The affiliates must take advantage of all promotional tools to make decent earnings. You can track your performance and revenue real-time. Shorte.st is the best source for anyone who is looking to make money online. It works well for US, UK, Canada, Australia and European traffic. The conversions of Asian traffic are comparatively low. The users and affiliates who had tried this network can share their experiences below. You can also send payment screenshots. Hope this Shorte.st review help users to get started.